Search engines like Google, Yahoo and Bing don’t employ people to browse through the millions of websites across the internet and index the pages on them, search engines use robots (bots) or search engine spiders to access the different websites on the internet. It’s an essential part of SEO that you must know how search engine robots reads a website, here are four easy steps that will guide you through the process. Once a search engine bot arrives to your site the first thing it will look for is the file named robots.txt. 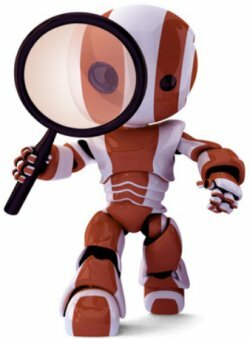 The robots.txt file can pass on instructions to these search engine spiders on what are the places you need these bots to crawl or not to crawl and index. After checking through the robots.txt file robots will then move on to read the meta title tag and meta description tag which will be used for indexing your pages, some search engines do not look for all meta tags (meta keywords tag is ignored by Google for example) due to recent spamming in the meta tags section, search engines now start to avoid them and give more importance to the title tag and meta description tag. Finally the bots will check if the contents posted on your blog resembles the contents in some other location in their search engine database and prioritize your index accordingly, if your contents are duplicate to some other contents on the web then there is a chance that your rankings for that particular page will be low or it will be included in the supplementary index. In other words don’t copy another websites content, Google in particular are very good at determining who owns the content. You will have to make sure that your keyword density percentage is healthy and is not over the search engines limit. If you are using a keyword for more than 2 to 3 times in 100 words, you may be in trouble with a KW density that’s too high. The search engines will recognize your content as spam. This will badly hurt your SEO campaign. So make sure you are not making this mistake and that you are only using the keywords according to the search engine guidelines. IME a keyword density percentage of around 2% to 3% works best.